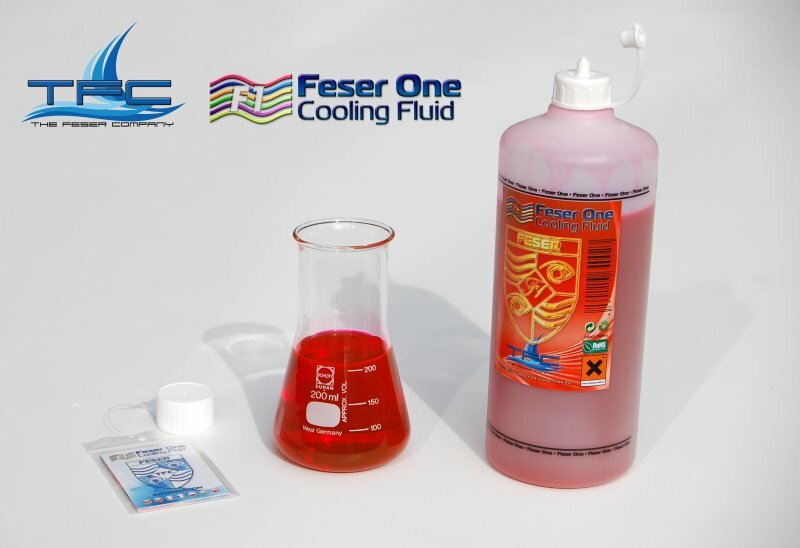 Feser One - the only coolant you will ever need! Perfecting the way you cool your system, safely and paving the way to the future. We have tested this product as replacement coolant in every leading manufacturers watercooling system with great results! Our priority for the liquids is to improve the corrosion protection. Different manufacturers of liquid cooling systems use different metals in their systems. To protect all these kinds of metals we developed a cooling agent, which protects the metals COPPER, ALUMINIUM, BRASS and NICKEL. The characteristic is here with the inhibitors, which prevents the corrosion of all metal parts in the cooling circuit at the same time. By this new development it is compatible with each system. By the additive of different coloring materials the liquid gets the appropriate color. With addition of UV active materials, so-called artificial tracers, the liquid begins to glow when ultraviolet light hits the material in the liquid. For theses effects you only need a CCFL / UV Cold Cathode light tube which is already on the market and available from different third party manufacturers. There are many types of algae and also a few organisms that look like algae but are not algae at all, mostly some kinds of bacteria. Algae that is red or brown may indicate a water quality problem, such as high dissolved nitrate or phosphate levels in the water. Our liquids are low of nutrients, treated by filtration and sterilization methods that tremendously reduce and prevent the growth of microorganisms. The Liquids are manufactured and supervised in Germany in our production hall. All necessary components for the liquids are manufactured in Germany. In co-operation with specialists for corrosion protection at the professional school Südwestfalen / Germany, we developed this liquids particularly for PC water cooling systems. The liquids are examined each month for its consistence and submitted of different long term test in cooling systems. Thus we always ensure a safe and optimal product. In the laboratory for corrosion protection technology we can develop the liquid permanently further and adapt new standards. No other additives are needed, we have 4 anti corrosives inside! Regular water changes are advised (maximum 1 year). Depending on your hose size, type and wall thickness, Feser One may react differently under uv light in different cooling systems. Dangerous to health when swallowing! Keep out of the reach of children! Avoid contact with eyes and skin. Catch up medical advise when swollowed and show label. If spillage occurs use absorbent material and dispose in the correct way. Clean skin with much water and soap. Rinse out eyes with much water.